Fighting Parkinson’s, and the Los Angeles Workshop was energetic! As you know, on Saturday, August 24, 2013, I had my eighth workshop in taking my Parkinson’s Recipe for Recovery® on the road. This seventh venue of 2013 was Los Angeles, CA, and the day was energetic! Imagine: 15 of us, some with Parkinson’s, some of their spouses and partners and friends, one of my daughters and one of her friends, all in one place with one purpose…Parkinson’s recovery. The room was filled with great energy. Early in the workshop, there was a buzz about the room…questions being asked, answers coming from me and from other participants. We all were learning from each other. We were sharing lives and Parkinson’s with a sense of vulnerability and compassion. There were smiles, and tears, and hugs. We were a family of people, most meeting each other for the first time, and we were united in our fight against Parkinson’s. Stories were shared, and nobody felt alone. People listened as others shared their journey, and each person had the feeling, “that sounds just like how I feel…physically, mentally, and spiritually.” It was energizing. It was a day of being in the moment of Parkinson’s recovery. I was so much in the moment of the workshop that when I awoke on Sunday morning, it occurred to me that no picture of the group had been taken to share with you. I accept responsibility for the lack of a picture, and I am sorry I do not have one to present to you. I am not perfect, and surrendering the “need to be perfect” was instrumental in my Parkinson’s recovery. The Los Angeles workshop group was a group of people not afraid of their Parkinson’s. They inspired me. They were people filled with courage and hope and faith and spirituality and gratitude and love and compassion. And, when you have a room full of people not afraid of their Parkinson’s, their Parkinson’s becomes afraid of them! 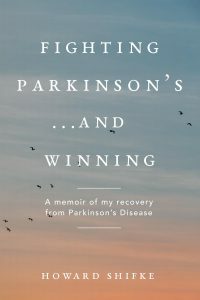 In a room filled with love and compassion and vulnerability and gratitude and healing, Parkinson’s did not dare show its face…at the end of the day, this was very energizing for all of us. “I have the power to heal myself. I am recovery!” The people in Los Angeles felt it, and then they knew it. Please take inspiration from this group and feel it, and then know it in yourself. 8 Responses to Fighting Parkinson’s, and the Los Angeles Workshop was energetic! and the world will feel the echo of our healing. And the world will feel the echo of our togetherness too!…..there is tremendous strength and courage in that…. thank you, Marilyn!…. thank you, Howard!…thank you all! I was blessed to be able to attend the workshop. Am I glad that I did? Very! His description of the day tells it true. Howard is a stellar presenter so the day flew by and before I knew it we were saying goodbye. I was very touched by the spouses/partners that came to support their loved ones. How important it is to have loving support. Howard. Please come to the UK. We need you here too! Any updates on the San Francisco workshop date?